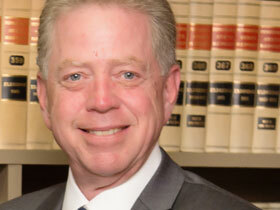 Steve Kelly focuses on complex litigation including personal injury and wrongful death cases, government affairs and municipal law, commercial law, all manner of criminal defense including DUI, white-collar prosecutions and drug offenses, and Steve handles many education law and family law cases. Since joining Brutscher, Foley, Milliner, Land & Kelly in 2014, Steve has won many major victories for clients in numerous venues throughout the area, including federal and state courts, and before various boards and commissions. Steve began his legal career working for the House of Representatives for the State of Delaware. He next served as a judicial law clerk before joining the Chester County District Attorney’s Office where he served as a senior trial lawyer for over 25 years. During that time, he tried more trials to a jury in the Chester County Courthouse than any other attorney in the county. In addition to trying high profile cases, Steve was placed in charge of police officer training, and was responsible for running both the Investigating Grand Jury and the felony drug unit. His notable career includes the successful prosecution of numerous capital murder cases and highly publicized white-collar prosecutions, gaining numerous convictions of corrupt attorneys and public officials. Steve earned a bachelor’s degree in Economics at the University of Delaware and his law degree from the Delaware Law School. He is a graduate of the Career Prosecutor Course at the National College of District Attorneys and served on the faculty of the National College of District Attorneys. Steve continues to be active in the local community. He is proud to have been able to work extensively with church and neighborhood groups on revitalization efforts in the City of Coatesville, and he served for many years on behalf of the residents of Kennett Square as a member of borough council. He currently serves on the Chester County Prothonotary’s Advisory Committee and enjoys volunteering with community oriented groups such as the Joseph & Sarah Carter Community Development Corporation.